The Cultural Studies Section of the Department of Literary, Cultural and Communication Studies (LCCS) hosts Film Night with a screening of the documentary Ninth Floor followed by a Q&A session with its TT-born, Canada based producer Selwyn Jacob. The screening and discussion takes place July 20 from 5.30 to 7.30pm at the Centre for Language Learning (CLL) Auditorium. 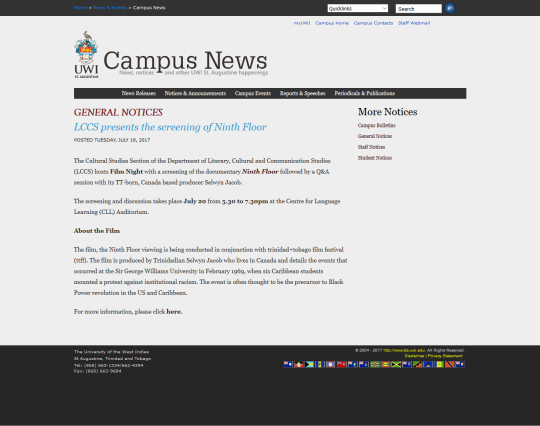 The film, the Ninth Floor viewing is being conducted in conjunction with trinidad+tobago film festival (ttff). The film is produced by Trinidadian Selwyn Jacob who lives in Canada and details the events that occurred at the Sir George Williams University in February 1969, when six Caribbean students mounted a protest against institutional racism. The event is often thought to be the precursor to Black Power revolution in the US and Caribbean.